My obsession with capes began several years ago when Blair Waldorf sported a chic all black ensemble with a black cape and beret. Ever since, I have been on the lookout for a classic cape. When I think of capes, I envision anything embodying Paris- berets, black cigarette pants, chic flats, and the Eiffel Tower appearing in the background. 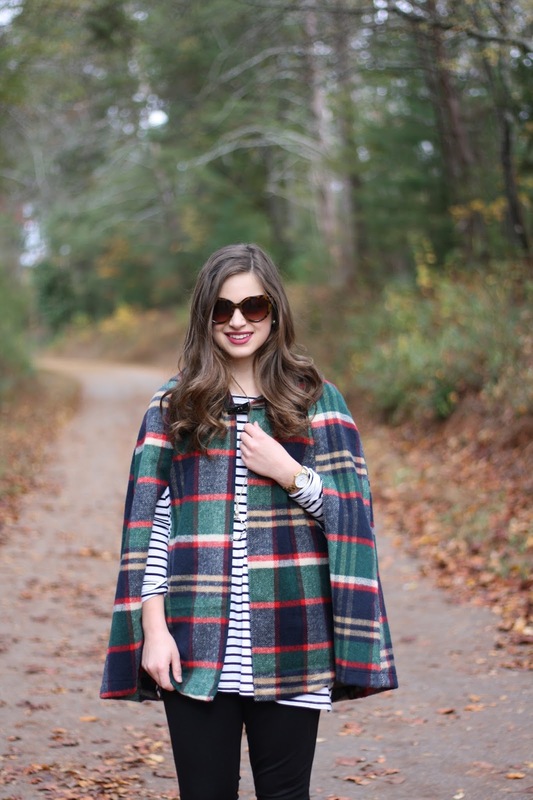 Such a piece deserves more attention, and I was so excited this fall when capes started to come back into style. I think the silhouette is so classic that it honestly could never be "out" of style, but let's just say I'm ecstatic that capes are trending. 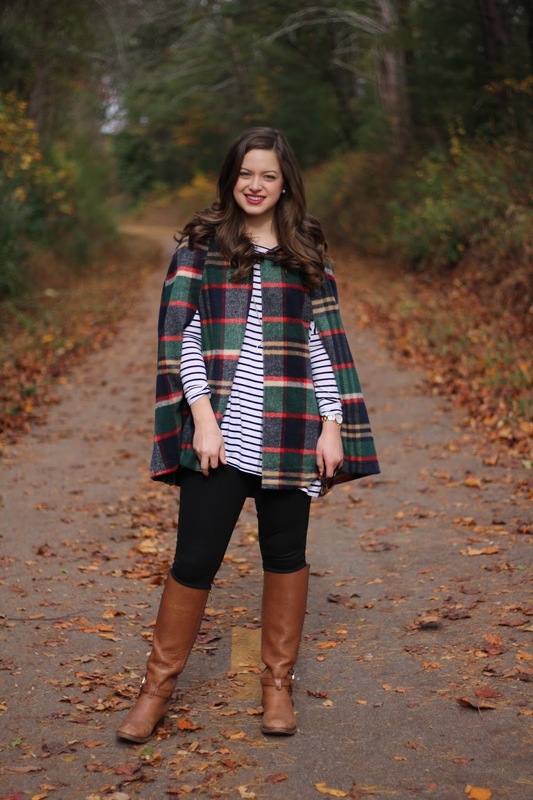 So many brands, including ModCloth, J.Crew, and Red Dress Boutique, have released their rendition of a classic cape. 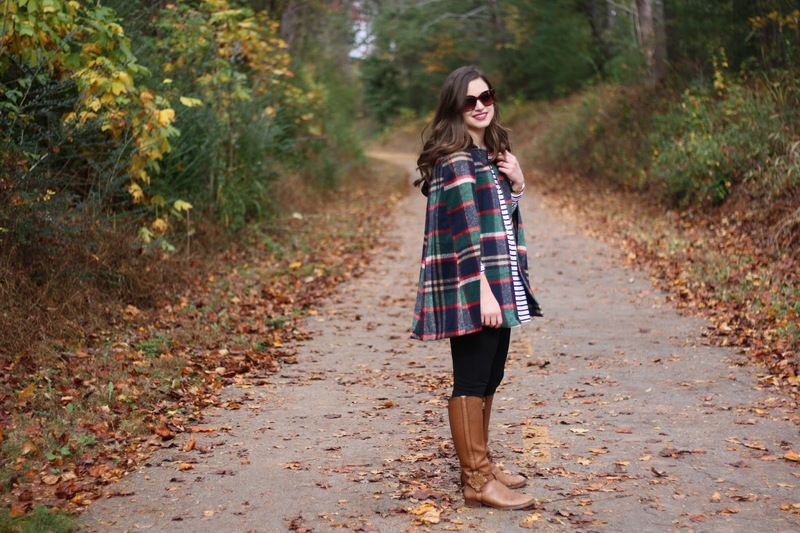 Plaids, herringbones, knits, and solid hues are on the market. 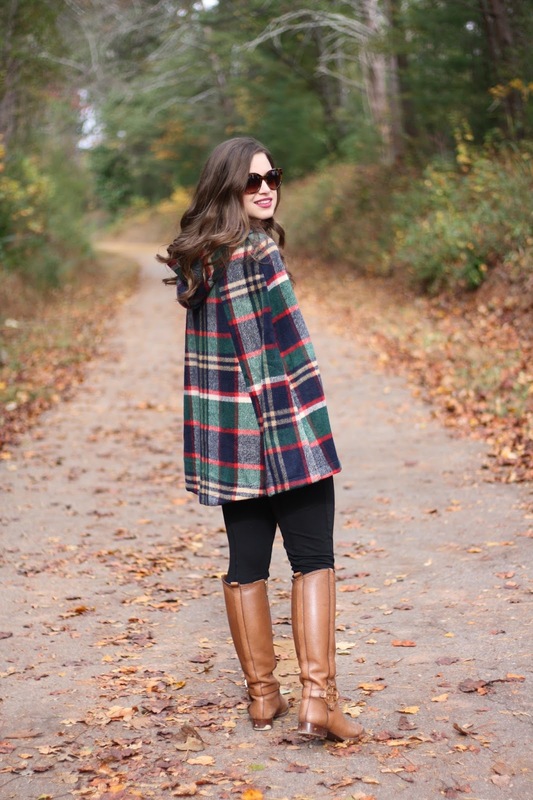 When I stumbled upon this plaid cape from Red Dress Boutique, I immediately hit the purchase button because it was a match made in heaven. 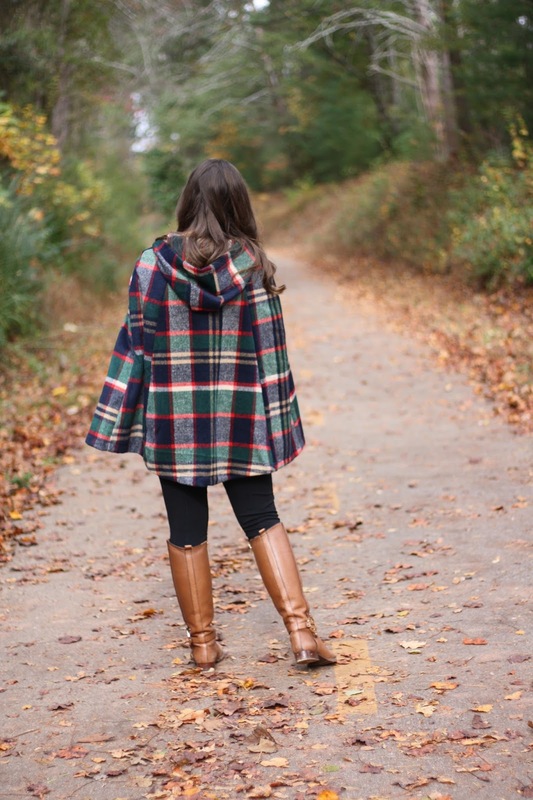 Since a cape is the center of attention in an outfit due to its shape, I suggest wearing the piece with skinny jeans, cigarette (pixie) pants, or leggings. I paired my cape with pixie pants- a staple in my closet as I'm sure you all know. 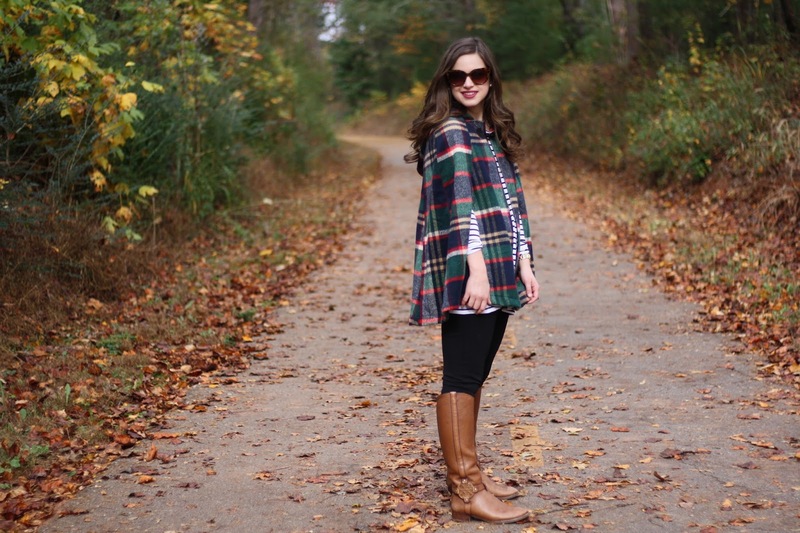 Underneath the cape, neutral colors, patterns, and fabrics are a must. I have seen simple t-shirts, button ups, and even sweaters underneath these pieces, so the options are most definitely endless when deciding what to wear with your cape. 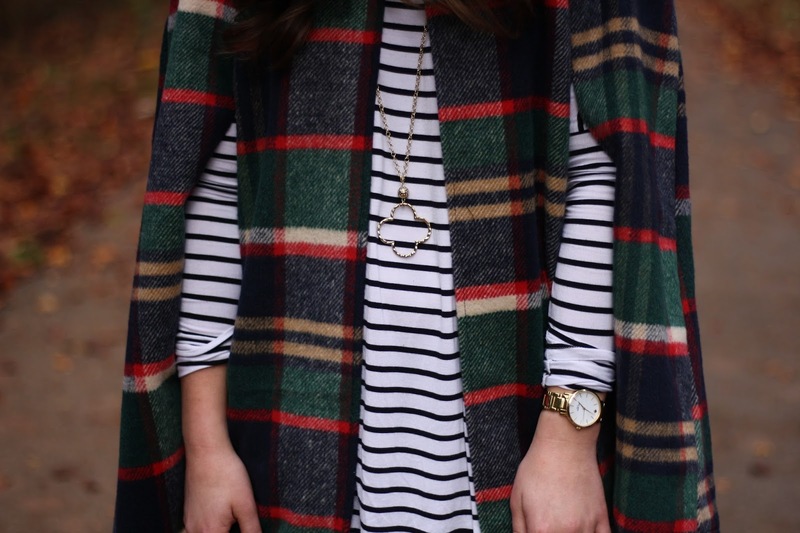 I love a good pattern-mix, so I layered this black and white top underneath. 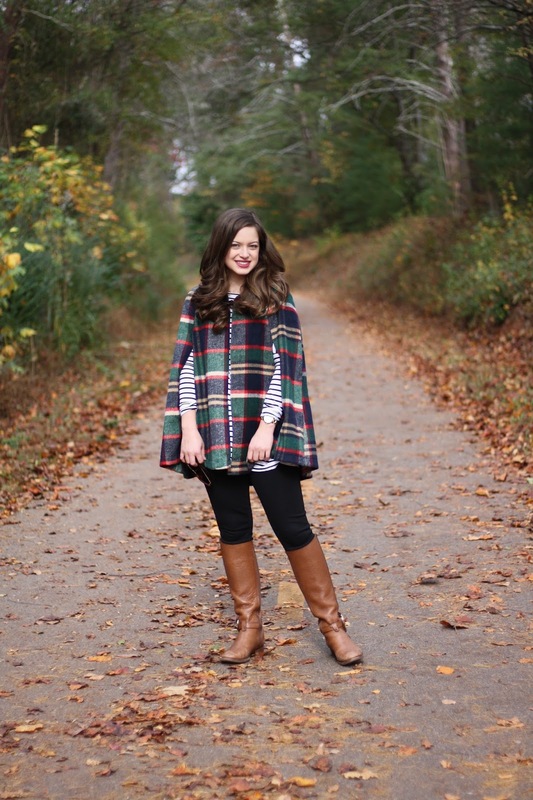 If your cape is a solid color, consider wearing a patterned top underneath or patterned/colored pants. A little accessorizing is always a must, so I chose to draw attention to the cape with this quatrefoil pendant necklace from Marley Lilly. I've been loving long pendant necklaces this year, and I love how these necklaces look with capes. If you want to go for a French-inspired look, consider adding a beret (which is totally trending right now!) or a neck scarf. A classic pair of pearls is also perfect for a cape. I hope you all had a lovely Thanksgiving and start to the holiday season. What screams holidays more than this cape am I right?? Get it while you can because it is a fast seller at Red Dress. Happy holiday shopping this weekend- the first of my gift guides will be up Sunday!